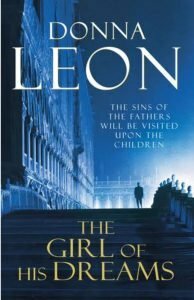 In “The Girl of his dreams”, the 17th in the wonderful Commissario Brunetti series, we once again are privileged to witness the author Donna Leon on top form. Every single book in the series is excellent. Each book, and they are all stand-alone books by the way, is a love-song to Venice. Each one is also a cracking mystery. And – and this is what makes Ms Leon’s books so very, very absorbing – in each book, she shines her spotlight ioto another aspect of the city. In this book, it is the plight of the refugees and the gypsies (“Rom” we are often reminded to call them, by various characters in the book) who flock to the city and who are viewed with great suspicion and open dislike by so many residents. We meet up again, with great pleasure, with the thoroughly decent, thoroughly likeable Commissario Brunetti, his wife Paola and their 2 now-teenaged children, Raffi and Chiara. One never tires of joining the Brunettis at table, as they eat, and enjoy their wine and post-dinner grappa on their terrace, as the children recount their day, and quiz their parents about current affairs. There is always talk of English literature, thanks to the ferociously well-read Paola, there is hearty criticism of much of what ails Italy – politics and corruption, and there is much robust criticism of the church. Through these dinner-table conversations, we feel fully immersed in the day to day life of Venice and her citizens. With each book, we learn another detail or two about the Commissario, his wife and his children – a family that is totally engaging and endearing. In this book, we see a little more of the home life of Brunetti’s trusty assistant, Vianello and his wife Nadia, and with great pleasure, we catch up with the ever-glamorous and ever-resourceful Signorina Elettra Zorzi. Signorina Elettra is a wonderfullly resourceful young woman, casually navigating her way through the city’s computer systems, mining information to help Brunetti and Vianello, though she actually works for the vain and self-absorbed Vice-Questore Patta. Patta is on top form in this book, trying to use English buzz-words such as “inter-cultural dynamics” despite his impenetrable Sicilian accent, and – as ever – firmly on the side of the rich and famous, rather than the rule of law. There are two story lines running through this book, one involving religion and the other the death of a child. 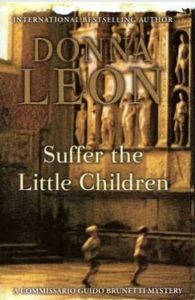 The investigation into the death of the child leads Brunetti and Vianello into a world they have not hitherto encountered, that of the secretive and unfriendly gypises – Rom – who exist on the margins of Italian society, and are both disliked and misunderstood by the Venetians. We see another side of the city, that of dispossessed people and there is a roughness and ugliness to the world they inhabit, especially when seen through the eyes of a man with the aesthetic sense of Commissario Brunetti. An excellent read – as are all the Brunetti novels – with death and religion as the central themes that are woven into the narrative. 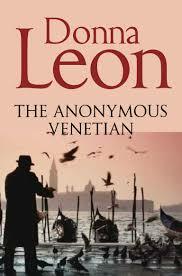 An enthralling plot, lots of twists and turns and, as ever, the magnificent canvas of La Serenissima. If you haven’t already read this book, please do go ahead and order your copy right now. Couldn’t be easier – the link is below.